I went to a recent talk given by Dr. Anat Matar on her recent visit to London. Dr Matar is a senior lecturer in the Department of Philosophy at Tel Aviv University. She is also an Israeli citizen who wants the world to boycott Israel. She is a member of Who Profits? Exposing the Israeli Occupation Industry. Dr. Matar feels that the only way to end Israel’s occupation of the West Bank is for there to be an economic, cultural and academic boycott of her own country. Imagine boycotting yourself! Would any Brit or American call for a boycott of their respective countries over Afghanistan or Iraq? Only a courageous, caring and unselfish person would even contemplate this, surely? Her son, Hagai, spent two years in an Israeli prison for refusing to enlist. She understood this argument and said we must be watchful and that “I am not going to go back to Lithuania”. (Dr Matar believes in the end of the Jewish state and so I wonder how she can be so sure that she would never have to go back to Lithuania since Muslim countries have ejected nearly all their one million indigenous Jews. If Israel became “secular and democratic” and, ultimately, a Muslim country she could well be on her way back to Lithuania). She said that all the varying approaches to attacking Israel should be considered and each organisation should unite and then consider which approach is best. For example, choose particular campaigns like boycotting merchandise made in the occupied territories but not the Tate Modern’s exhibition of Israeli video installations that is taking place this weekend in London. “Don’t boycott this. You have to look at the names of the Israeli artists. 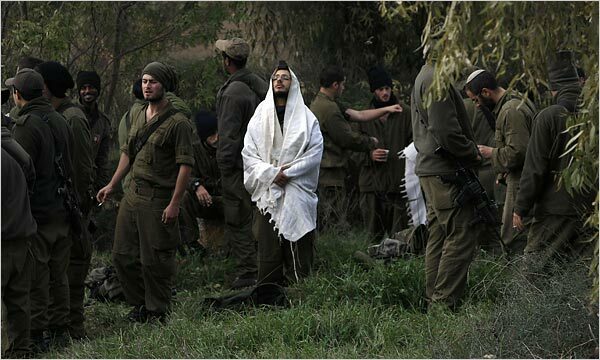 Some of them are refusniks and great anti-Zionists,” Dr. Matar said. Poor Anat. Her own supporters attacking their boycott heroine. She tried to put across her ethical argument and explained how hard it is to be an artist in Israel: “You can’t make a film or be a dancer without taking money from the Israeli government. If you are rich you are alright but if you are poor and an artist and support the occupation what do you do? They can’t give up their lives. If they support the boycott it will finish their careers”. I then realised how wrong I was. I had honestly respected Dr Matar. However misguided, she actually seemed to be willing to sacrifice herself for what she perceived to be the greater good of Israel and the Palestinian people; an academic boycott in which even she would suffer. But in effect she was calling for an academic and cultural boycott just so long as those who are against the occupation are not affected which, conveniently, includes herself. Dr. Matar isn’t as courageous as she would like people to think she is. Meanwhile, you can make your way down to the Tate Modern this weekend and see what Israeli artists have to say about Israel through their art. Colonel Richard Kemp CBE, the former commander of British forces in Afghanistan, addressed the 110th Anniversary Dinner of the British Zionist Federation on sunday night. He spoke of his admiration for Israel’s support for the British army and the way the Israeli army went about Operation Cast Lead in trying to limit Palestinian civilian casualties. On Sunday night Colonel Kemp told his audience of how a Brigadier-General in the IDF, its leading expert on suicide bombings, advised him in detail about suicide bombings when he first arrived in Afghanistan on 2003. This advice formed the basis of the British army’s doctrine for dealing with suicide bombings. He drew the comparison of Israel’s fight against Hamas and Hezbollah and that of Britain’s against Jaish al-Mahdi which was “responsible for killing large numbers of American and British soldiers in Iraq”. He pointed out that Hamas, Hezbollah, Jaish al-Mahdi and the Taliban are all motivated, trained and armed by Iran. The difference, he said, between British forces and the Israeli army was that British forces do not go into battle knowing they will be condemned by the media and respected international bodies, like the UN, and accused of the most horrific things. He said that Israeli pilots were allowed to abort a mission if not satisfied that civilians were not at risk. He referred to the three hour unilateral ceasefire during Operation Cast Lead which no other nation would consider knowing that the enemy would use it to rearm. He finished off by saying that while Ahmadinejad was still in power in Iran there would be no peace in the Middle East and that “a lot of the adverse propaganda is based on anti-Semitism or anti-Israel sentiment. Dark forces are at work which are exploiting the media”. Yuli Edelstein, Minister of Public Affairs and the Diaspora in the Israeli government, also spoke. There was a small anti-Israel demonstration outside the event. I have just bought my copy of the Current Bun (Britain’s most widely read daily newspaper) and it seems we could once again be going to war with Argentina over territory that is 8,000 miles away. Isn’t it about time we withdrew our 3,000 citizens from the Falkland Islands and look to make peace with Argentina? This is an issue that is never going to go away. It is an occupation similar to Israel’s in the West Bank, except we have no security reasons to be occupying the Falklands. In 1982 war raged for 74 days and we lost a staggering 255 soldiers, while Argentina lost 649. We even sank an Argentinian warship, the General Belgrano, while it was not enagaged in battle. 323 Argentinians went down with it. 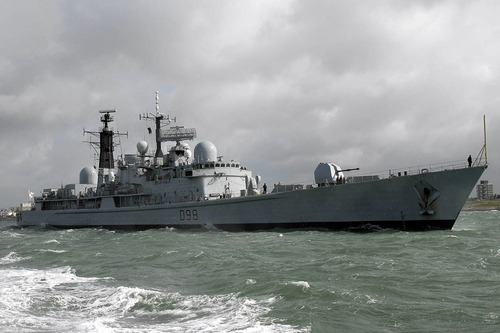 Four British based drilling teams are due to start work off the Falkland Islands next week, much to the chagrin of Argentina, and we have sent HMS York, a destroyer, to guard them in the wake of the increasing tensions between the two countries. Argentina has decreed that boats travelling through its territorial waters need to obtain special permission before doing so, which could inhibit the drilling. Argentina still claims the Falklands and surrounding waters as their own. Maybe they are wrong but there has never been a judicial court decision as to who owns what. We keep hearing how Israel is apparently “in breach of international law” for being in the West Bank but are we not in breach of international law for being in the Falklands? The islands have been conquered, abandoned and reconquered successively by France, Spain, Argentina and Britain. From 1820 to 1833 Argentinians were living there until we threw them out. Now they want them back. Surely, the only fair thing to do would be for the International Court of Justice to convene in the Hague to try the sovereignty issue once and for all. It would be hassle, but not overly problematic, to remove 3,000 people and to rehouse them back here (Israel withdrew 7,000 from Gaza). No British soldier deserves to lose his or her life over a tiny piece of territory so far away from us. Yes, the loss of the oil reserves will hit our already battered economy but then our army won’t be diverted from where it is currently needed most; fighting Islamist terrorism. And, finally, when all is said and done we might even then have some moral authority with which to preach to Israel about ending its own occupation of the West Bank. The Liberal Democrats are at it again. 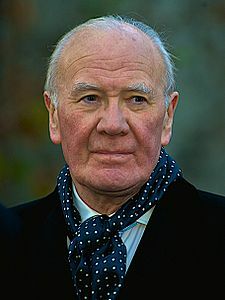 I have just listened with incredulity to Sir Menzies Campbell, MP for North East Fife and one-time leader of the Liberal Democrats (who else), tell us of his concern for two British passport holders who are today in total fear after Mossad’s alleged assassination in Dubai of Mahmoud al Mabhouh while using fake passports with their names on. I don’t wish to devalue their fear but from a utilitarian point of view if one had to choose between two people feeling undoubtedly scared and the assassination of someone who Hamas has admitted murdered two Israeli soldiers in 1989 and who is responsible for purchasing armaments from Iran to supply to Hamas in Gaza, leading to the deaths of many Palestinians and Israelis, I know which choice I would go for. Don’t the Lib Dems know when to stop or even lie low for a while? Whenever there is controversy where Israel “might” be implicated, they are out in force briefing against Israel. Does Sir Menzies really think that MI6 wouldn’t take the same action if British citizens were about to be “whacked” by someone like Mabhouh? And does he really think the assassins should have entered Dubai on Israeli passports? And as a lawyer he might be aware of a certain maxim about being innocent until proven guilty. Obviously not when it comes to Israel! 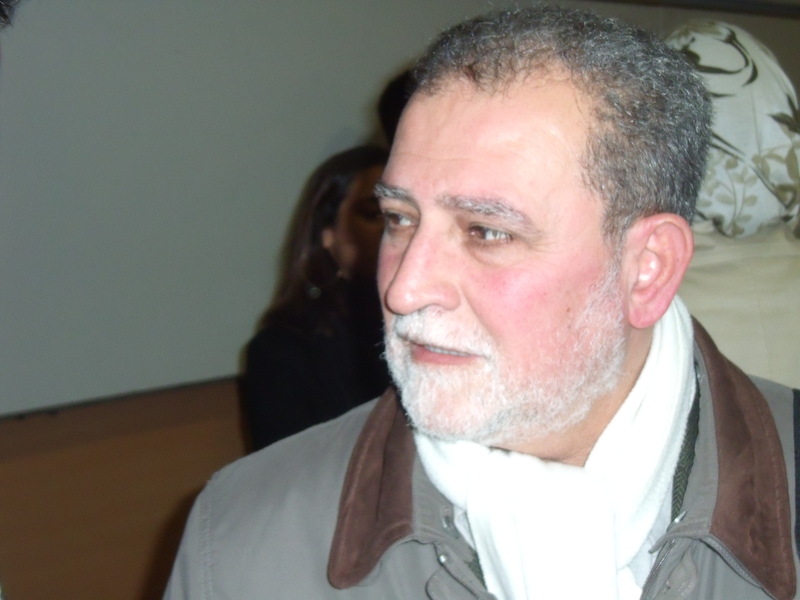 Israel, after all, did admit to the attempted assassination of Khaled Meshall, the political head of Hamas, in Jordan in 1997. There has been no admission forthcoming so far about Dubai. There are any number of countries who might have wanted Mabhouh dead and for a string of reasons. I am not sure that the Foreign Office summoning the Israeli Ambassador, Ron Prosor, for a dressing down tomorrow is going to shed any light on events that took place in room 230 of the Al Bustan Rotana hotel on the afternoon of January 20. To think that Sir Menzies actually applied to be our Prime Minister once. Who would seriously wish to travel on the tube or a bus with him at the helm “playing it by the rules”? Until Sir Menzies calls for the disbanding of said MI6 he should be dismissed as nothing more than yet another Lib Dem activist who has just got it in for Israel. “With the ‘peace process’ stalled and facts on the ground making a two-state solution increasingly difficult what hope is there for progress in Israel and Palestine in 2010? What role can or should the United States and the European Union play? The first question presumes that “the facts on the ground”, a general euphemism for the settlements, are the main problem to peace. Obviously, this reduces the argument to putting all blame solely on Israel. Nevertheless, I agreed to publicise the event due to the presence of a representative of One Voice on the panel. One Voice is a large and growing movement of moderate Israelis and Palestinians who are engaged in conflict resolution with the objective of negotiations leading to a two-state solution to the Israeli/Palestinian conflict. John Lyndon, Executive Director of One Voice Europe, will be speaking alongside three other panellists who are either highly critical of Israel or are against Israel’s existence as a Jewish state. But to hear the views of One Voice will be well worth it. Perspectives on Israel & Palestine – What can we expect in 2010? Israel and Palestine in 2010? What role can or should the United States and the European Union play? The panel will answer questions submitted by MPs, peers & activists as well as presenting their own analyses of the current situation. Thanks to Glenda Jackson MP for facilitating this event. 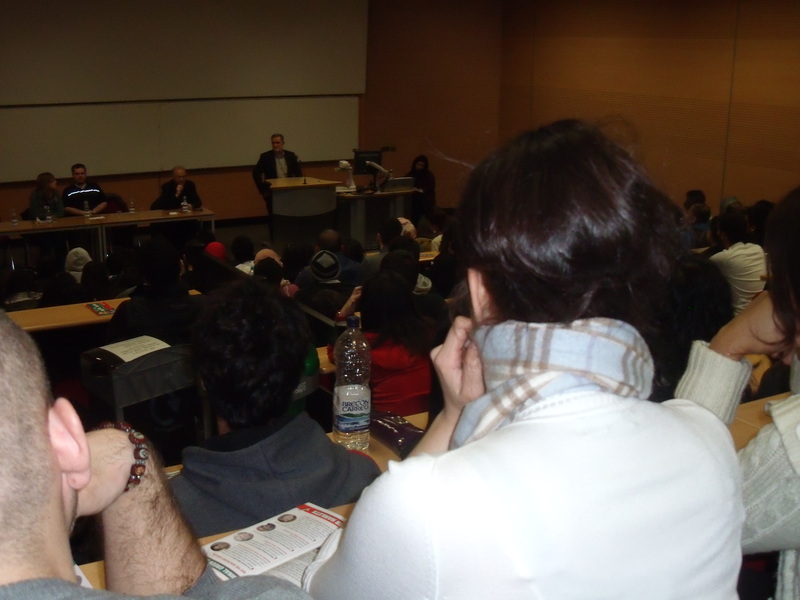 Tonight there was a two for one offer on as Queen Mary, University of London’s Palestine Society held its inaugural meeting where about 300 students heard George Galloway and Azzam Tamimi speak. 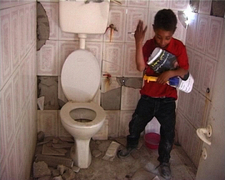 Tamimi is notorious for condoning suicide bombers inside Israel. This was Mile End, the heart of George Galloway’s parliamentary constituency of Bethnal Green and Bow, and so it was a good opportunity for the Respect Party’s parliamentary candidate to make an appearance. Abjol Miah’s leaflet screams, “I am Bethnal Green and Bow to the Core” before stating on the back “Justice for Palestine”. Incidentally, George will be the Respect Party’s parliamentary candidate in the neighbouring constituency of Poplar and Limehouse on May 6th, where the Labour majority is just 3,942. 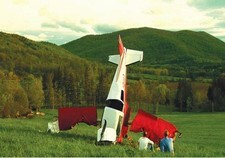 But I am just recovering after a bit of nastiness I was unlucky enough to get involved in. On my way home I passed George outside the college telling some students how Israel’s attack on Iran is getting very close now. I then asked him about the Egyptian border guard shot dead by a Hamas sniper when the Viva Palestina convoy was trying to enter Gaza last month. At that point his heavies stepped in and repeatedly demanded to know my name while also accusing me of trespassing and recording the conversation surreptitiously. This allowed George to slip away and drive off. In all fairness to George he was actually willing to stand and engage with me but inexplicably his heavies intervened and the situation was getting a bit fractious to say the least. At the event proper we heard initially from Bellavia Ribeiro-Addy, the NUS Black Students’ Officer. She mentioned the Black Students’ Union pro-Palestine policy and condemned the President of the NUS for both visiting Israel and saying that the majority of students were actually pro-Israel. He is now facing a motion of no-confidence at the next NUS executive meeting. Next was Azam Tamimi. 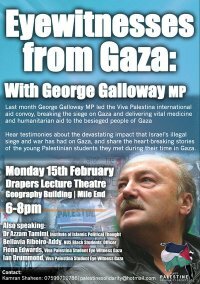 He congratulated QMUL for going ahead with the meeting after “they had tried to stop me speaking at Cambridge, Manchester, SOAS and Birmingham which shows Israel is losing the war”. He said he is “more semite than any Jew in the world”. He said that supporters of Israel are ignorant and brainwashed and cited the film Defamation which “shows how Jews are brainwashed into believing they are under threat and that Israel is their protector and therefore they have to defend Israel no matter what”. Read my lips: "I don't have a problem with the Jews"
He criticised the reporting of his speech at SOAS and told those who had “twisted” his words to listen carefully: “I have no problem with the Jews, I only have a problem with the Zionists”. (What I don’t get is that he opened his speech condemning the Zionists who had come from Europe to escape the Holocaust. Bearing in mind that they were all Jewish it doesn’t follow logically that he doesn’t have a problem with Jews). He said Hamas is the true representative of the Palestinian people and that the only solution was for “the Israelis to apologise to the Palestinians for all the injustice they have caused them and to ask for a new chapter to begin. Only then would we agree. The Jews have never suffered in Muslim lands, only in Europe and Europe threw them out and sent them to us”. Finally, George spoke. 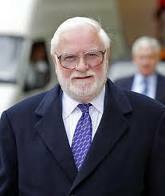 He started by addressing those of “ill will” who might be present and said they “can email as much as they like and complain to OFCOM, the Charity Commission and the police but if you kill us our sons will pick up the banner”. He said anti-Semitism is only a European Christian phenomenon and while the Holocaust was the biggest crime in history the Palestinians are paying the price for it. He finished off by claiming that the leaders of Britain and America, including George W. Bush, hated the Jews. During the Q&A a student said that “the biggest crime in history was not the Holocaust as that had only gone on for four years. The biggest crime was against the Palestinians as that has been going on for 60 years”. That just about summed up the level of discourse tonight.